2.85 acres on the southeast corner of Highway 287 and FM 730. Site offers high visibility from both a U.S. Highway and a Farm to Market Road. Easily accessible to Highway 287 and FM 730. Within close proximity to on and off ramps. Property offers over 300 feet of frontage on Highway 287 and nearly 690 feet of frontage on FM 730. 120 feet of additional frontage present on exit lane. Tract had an average daily traffic count of 32,985 in 2015. Located within the City of Decatur ETJ. Surrounding properties are zoned commercial. City of Decatur water and sewer are accessible. Developer is willing to discuss bringing water and sewer lines to the site. Electricity is on site. Excellent location for retail or restaurant that requires high exposure. Possible assemblage opportunity with neighboring properties for a total of 13.35 to 24.71 acres with Highway 287 and FM 730 frontage. Expanding the site to 13.35 acres would add 845 feet of frontage on Highway 287 and another 380 feet on FM 730. 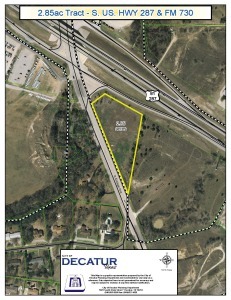 Lot is within close proximity to destination retailers including James Wood Motors and Karl Klement Ford.